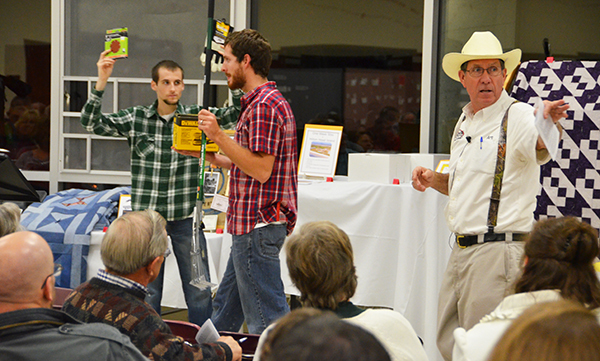 Tag Archive | "Kevin Grifhorst"
A live auction raised over $25,000 for Pine Ridge Bible Camp. With Christmas songs playing in the background and holiday decorations on every table, 250 people shopped at the Pine Ridge Bible Camp’s 11th annual auction, held at Cedar Springs High School on November 8. A beautiful display of free Hors d’oeuvres and slices of layer cake added to the festive atmosphere, and shoppers tried to outbid each other during the silent and live auction. Director Kevin Grifhorst spoke halfway through the live auction and read portions of letters describing what going to Pine Ridge Bible Camp means to children and their families. Bidders were given the opportunity to contribute towards scholarships for children. In a matter of minutes, over $7,000 was raised to help send children in need to camp. In just one evening, 380 items were sold to raise a record-breaking $25,500. Then, an anonymous donor matched that amount and doubled it to $51,000. With $14,000 set aside for the camp scholarships, the rest will be used to help finish the lower level of the VerLee Dining Hall & Retreat Center at Pine Ridge Bible Camp.